17 Voted against support for "Contras"
25 "Is the Pentagon Budget Increase Needed?" John Conyers, Jr. is a far left member of the United States House of Representatives, representing the 13th district of Michigan. He is chair of the House Judiciary Committee. Serving his 21st term in Congress, he is the second most senior member of the House and dean of the Congressional Black Caucus. He was also a founding member of the Congressional Progressive Caucus and an original member of President Nixon’s Enemies List. Among his accomplishments in Congress: the Violence Against Women Act of 1994, the Motor Voter Bill of 1993, the Martin Luther King Holiday Act of 1983, the Alcohol Warning Label Act of 1988, and the Jazz Preservation Act of 1987. A legendary force for peace, civil rights and social justice, Rep. Conyers has worked closely with PDA to hold the Bush Administration accountable for manipulating Iraq intelligence, and in exposing voting irregularities in Ohio in 2004. He is a Korean War veteran. Conyers is married to the former Monica Esters. Fringe politician that he is, Conyers is no backbencher. On his Website he calls himself "a senior statesman in American political life." The 20-term representative from Detroit is the second-most-senior member of the House, and serves as the ranking Democrat on the House Judiciary Committee. John Conyers, Jr. was born in 1929 in Detroit, Michigan, son of Lucille Simpson and John Conyers, Sr.. After graduating from Detroit public schools, he earned his B.A. degree in 1957 and his J.D. degree in 1958 from Wayne State University. Before beginning a career as a private attorney, Conyers served one year in Korea as an officer in the U.S. Army Corps of Engineers and was awarded combat and merit citations. In 1958, Conyers began his work in politics as an aide to Congressman John Dingell, whom he served until 1961. Conyers made history when he was elected to the House of Representatives in 1964 on a platform of jobs, justice and peace. During his years in Congress, "social justice and economic opportunity" have remained focal points of Conyers' platform. Conyers was re-elected in November 2006 to his twenty-first term in the House, presenting Michigan's 14th Congressional District. His district includes Detroit and the Wayne County communities of Dearborn Heights, Pointe Shores, Grosse Pointe Woods, Harper Woods, Highland Park and Redford. Conyers is the longest-serving African American in the history of the House. He is the dean and a founding member of the Congressional Black Caucus. Conyers has been a vice-chairman of Americans for Democratic Action, the radical center of American politics. Conyers adopted the position that the Vietnam War was a racist conflict and he was one of only four members of the House of Representatives to vote against military support for U.S. troops in Vietnam. Other than his opposition to the Vietnam war, Conyer's interest in foreign affairs seems to have been confined to his adulatory support of the Communist Kwame Nkrumah, former head of Ghana. On the House Judiciary Committee, Conyers was the only member to oppose legislation designed to make desecration of the American flag a crime. In 1968, Conyers told The Worker, a Communist Party USA publication, that he was organizing a committee of blacks to evaluate candidates for the 1968 election. It was part of his overall program to organize American Negroes into one voting bloc. For his evaluating committee, he had chosen, among others, the revolutionaries Stokely Carmichael, Ralph Abernathy and Floyd B. McKissick. Around October 1971 Percy Sutton returned to Chicago, for another smokefilled- room meeting plus the third annual Black Expo, the black trade show — cultural fair sponsored by Jesse Jackson's Operation Breadbasket, the economic action wing of the Southern Christian Leadership Conference. Sutton was going to run one of the political seminars that will be a part of Black Expo, which has drawn around 500,000 visitors during its first two years and is aiming at 750,000 this time in its Sept. 29-Oct 3 run. Sutton, along with Rep. John Conyers, D.-Mich., Cleveland mayor Carl Stokes and Gary, Ind., mayor Richard Hatcher, were to be giving chalk talks on how to register voters and what to do with them when you have them registered, which is get them to vote as a bloc. In May 2013, John Conyers was listed as an associate member the of the Congressional Asian Pacific American Caucus. In 1981 John Conyers was a Vice President of Independent Voters of Illinois-Independent Precinct Organization. When Moscow, two other East European nations and Vietnam boycotted the 1984 Los Angeles Olympics, Rev. Jesse Jackson and John Conyers attempted to set up a special committee of athletes, civic leaders and members of Congress to "create a climate in which the decision can be changed." The group held its first meeting in Conyers office may 11. Jackson, after a one hour meeting with Soviet Foreign minister Dobrynin, said that both he and the committee were willing to go to Moscow. "I would say we have a about a one in ten chance" Conyers' press secretary Julian Epstein said. "They were firm in their position, but not final...The lines to the Soviet Embassy are being kept open.They are really bending over backwards to accommodate us. We will find out exactly under what conditions they would come back, and then get back with the US, Soviet, and international Olympic committees to see what we can mediate." In 1994 Jim McDermott, John Conyers and Paul Wellstone promoted a "single-payer" health care bill (HR1200/S491). Ellen Shaffer, a member of Wellstone's staff told the People's Weekly World that the authors had been "working closely" with Hillary Clinton. "She knows what they are doing" Shaffer said. 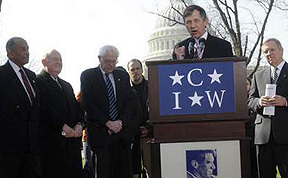 In February 2003 Jim McDermott, John Conyers, Dennis Kucinich and more than 20 others introduced legislation "medicare for all" (HR 676). In 1998 John Conyers Democrat was listed as a member of the Congressional Progressive Caucus. 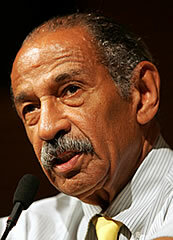 As of February 20 2009 John Conyers was listed as a member of the Congressional Progressive Caucus. Signatories included Rep. John Conyers. Signatories included John Conyers, Jr.. In November 2014, eight United States lawmakers sent a letter to Secretary of State John Kerry in which they say that ongoing Afro-Colombian rights abuses show that “Colombia is not in full compliance” with human rights policies required to receive US military aid. In the letter, coordinated by House Representative Hank Johnson’s office and signed by seven other members of Congress, the US politicians expressed “grave concern” over the human rights situation in cities on the Pacific coast, where the majority of inhabitants are Afro-Colombians. Rep. John Conyers (D-Mich.) talked of the “legitimacy and the necessity of the study of reparations” for the enslavement of African Americans in a speech at the University of Michigan, February 2002. Conyers’ speech was part of a number of events planned to celebrate Black History Month at the school. Conyers first introduced HR-40, the “Forty Acres and a Mule Bill,” as he called it, in 1989. The bill would not implement reparations, but would develop a federal government commission, appointed by the president and Congressional leaders, to study the issue. Included in the study would be the work of academics and politicians, but also discussions of ordinary people in town hall meetings. This view of the legitimacy of reparations for property loss was built into the Constitution, the Fugitive Slave Laws and the reaction of wealthy whites in the South to radical reconstruction. At the World Conference Against Racism, last September in Durban, South Africa, Bush administration representatives “refused to acknowledge that the enslavement of people is a crime – a hideous crime and a long-running crime, in the case of African Americans.” The healing process through discussion, acknowledgment and economic reparations may be unifying, in Conyers’ view. Anger at the Bush administration for waging war abroad and attacking rights at home bubbled up at the Congressional Black Caucus 33rd Legislative Conference in Washington DC, Sept. 24-27, 2003. “Collective Leadership: Challenging A Bold New World” was the title of the conference, which attracted thousands of participants in 53 plenary and workshop sessions. A standing-room crowd at a session titled “The Iraq War: America Speaks Out” convened by Rep. Charles Rangel (D-N.Y.), cheered Sen. Edward Kennedy (D-Mass. ), who recently accused Bush of “fraud” in tricking the U.S. into war. The White House reacted with rage to that blast. Civil rights leader Rev. Willie Barrow said, “Mr. Bush, you didn’t find Osama bin Laden, Saddam Hussein, or weapons of mass destruction. We know a lie when we hear it.” She challenged the crowd to start now to register millions of voters. “It’s not enough to register people. We have to get them out to the polls on Election Day,” she said. “Let’s come together and show Bush the door. In July 2006 Conyers addressed the Peace Action National Congress at Wayne State University, with Rep. Lynn Woolsey (D-CA), and activist and author Tom Hayden. Oct. 6. 2007 the Gray Panthers of Metro Detroit held a Dinner at United Food and Commercial Workers Union Local 876—The honorees include Saundra Williams, Elaine Crawford, Louis Green, Father John Nowlan, and the Raging Grannies. Keynote speaker is U.S. Rep. John Conyers, Jr. Contact for the event was Greater Detroit Democratic Socialists of America affiliate Ethel Schwartz. The National Lawyers Guild voted unanimously and enthusiastically for a resolution calling for the impeachment of George W. Bush and VP Cheney at their national convention in Washington, DC on November 2, 2007. The resolution listed more than a dozen high crimes and misdemeanors of the Bush and Cheney administration and "calls upon the U.S. House of Representatives to immediately initiate impeachment proceedings, to investigate the charges, and if the investigation supports the charges, to vote to impeach George W. Bush and Richard B. Cheney as provided in the Constitution of the United States of America." "the war of aggression, the secret prisons, the use of cruel, inhuman and degrading treatment, the use of evidence obtained by torture, and the surveillance of citizens without warrants, all initiated and carried out under the tenure of Bush and Cheney, are interesting under the U.S. Constitution and international law." The resolution provides for an NLG Impeachment Committee open to all members that will help organize and coordinate events at the local, state, and national level to build public participation in the campaign to initiate impeachment investigation, impeachment, and removal of Bush and Cheney from office without further delay. NLG members wishing to participate in launching this committee should immediately contact Ian Head in the National Office at "
The resolution also called on all other state and national bar associations, state and local government bodies, community organizations, labor unions, and all other citizen associations to adopt similar resolutions and to use all their resources to build the campaign. Passage of the resolution followed two events with John Conyers, Chair of the House Judiciary Committee, during the convention. First was a House Judiciary Committee Public Policy Forum on failure of the Bush/Cheney regime to observe international law. NLG members Marjorie Cohn, Jeanne Mirer, John Quigley, and Peter Weiss testified in the Judiciary Committee hearing room in the Rayburn House Office Building. Jeanne Mirer, Secretary General of the International Association of Democratic Lawyers, took the floor toward the very end of the hearing to say that a remedy is needed, that the remedy is clearly provided in the US constitution, and that this committee has the authority to get that process going. Conyers, who chaired the forum, asked her to repeat that point to make sure it was included in the record. He said that he would be holding further hearings and invited the speakers to return to testify on that remedy, impeachment. A couple of hours after that forum ended Congressman Conyers arrived at the convention to give his keynote address and answer questions before the 400 lawyers and legal workers in attendance. Former NLG president Michael Avery was first to line up at the microphone and asked Conyers what the NLG could do to help Conyers decide to initiate impeachment investigation of Bush and Cheney. Speaker after speaker pressed Conyers to take action on impeachment, many receiving thunderous applause. Although he remained non-committal, Conyers said he would like to participate in a series of public policy forums around the country that he said could consider the interesting actions by Bush and Cheney and that these forums could lead to the ultimate step of the double impeachment. He suggested that we can only expect Congressional action to follow establishment of a widespread public campaign visibly demanding impeachment. Conyers has been involved with the "WPFW since it's very inception," said Acie Byrd, the station's Board Gala Chair. Conyers serves as the Honorary Chair for the evening that Howard Zinn received the Pacifica Peace and Justice Award. He served as the Honorary Co-Chair with Attorney Roscoe Dellums. The WPFW is a Pacifica Radio affiliate. John Conyers was a guest speaker at Wisconsin's annual progressive Fighting Bob Fest, in 2005. 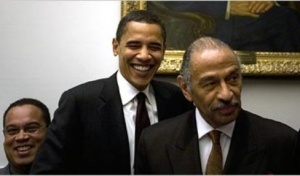 Barack Obama and John Conyers, Jr. Already nearly 9,000 people have sent the message online to the incoming Obama Administration that single payer is the one true health care reform that the country desperately needs. Now there are citizens groups across the country meeting to come together to collectively call upon the President-elect to consider single payer health care. Michigan Alliance to Strengthen Social Security and Medicare presented “Health Care for All,” a forum on Rep. John Conyers, Jr.’s U.S. National Health Insurance Act (HR 676) featuring Marilyn Clement (National Coordinator for Health Care NOW), Olivia Boykins (Special Assistant to Representative John Conyers, Jr.), and Democratic Socialists of America member Richard Shoemaker (retired UAW Vice-President and former director of the UAW General Motors Department and UAW Community Action Program) and moderated by Metro AFL-CIO President Saundra Williams—Tuesday, May 1, 2007 at International Brotherhood of Electrical Workers Local 58 (1358 Abbott Street, Detroit). Conact for the event was Democratic Socialists of America member Maurice Geary. Health Equity: On June 24 2009, NAKASEC and affiliates mobilized a dozen people for an evening action and rally that integrated cultural heritage with political expression in support of health equity within health reform legislation in 2009. Representatives from the Korean American Resource & Cultural Center of Chicago, staff from our national Los Angeles office and NAKASEC supporters from the DC metropolitan area were present to share the energizing beats of poongmul, express unity in fighting racial and ethnic health disparities, and promote culturally competent practices. Hundreds of people participated in the event, in partnership with the Service Employees International Union (SEIU), and heard Representative John Conyers (D-MI) and Representative Lucille Roybal-Allard (D-CA) speak from the podium on these issues. NAKASEC Board member Je Yon Jung introduced executive director EunSook Lee, who linked the language needs of our communities to the need to ensure access to healthcare for immigrants. The progressive Democratic community of the Detroit metro area met to answer the Tea Baggers at a “Call for Action” rally on the evening of February 18. Some 325 people attended the rally, which was held in the United Food and Commercial Workers hall in Madison Heights and sponsored by a wide spectrum of groups, from DSA on the left to Organizing for America, a political arm of the Obama administration, on the “right.” John Freeman, the moderator, made a point of singling out the DSA to praise for its support. The rally concentrated on five policy areas: immigration reform, clean energy, peace, health-care reform, and jobs. In addition to representatives of the groups pushing these reforms — among them DSA members Al Fishman and Dave Ivers — the rally was addressed by two members of Congress, Reps. Sander Levin (our senator’s older brother) and John Conyers. On June 27, 2011, Detroit was the second stop of the Congressional Progressive Caucus's "Good Jobs" tour. Reps. Hansen Clarke and John Conyers, D-Mich., joined with Keith Ellison, D-Minn., Marcy Kaptur, D-Ohio, and the Rev. Jesse Jackson listening to the "stories and thinking of the people". In their brief remarks, the leaders issued a call to redirect money from wars, Wall Street and the rich to a rebuilding of America. Jackson said war spending is "breaking our cities." He was seconded by Clarke who said the money we're spending in Afghanistan is ours, "it should come back to us." Kaptor said we need to tax the financial giants asking, "Why can't we tax hedge funds like we do the corner bakery?" Ellison emphasized that unity is required to win, saying being angry will not bring jobs but banding together, speaking together, and fighting together can. "We will use our strength in numbers to fight corporate greed," he said. Conyers said we are "getting ready" to re-elect President Obama but we need the President to get behind job creating legislation like the Humphrey Hawkins jobs bill he has introduced. "We are going to Washington to tell him we want him to lead in the fight for jobs. We will tell him we are ready to help," said Conyers. In mid 2011, "demands to address the country's jobs crisis are accelerating with the Congressional Black Caucus (CBC) joining a growing number of groups calling for federal action". The CBC resolved to hosting a For the People Jobs Initiative in several urban areas stricken by high unemployment. Signatories included Rep. John Conyers..
JStreet endorsed him again 2016. Rep. John Conyers has been a reliable friend of the pro-Israel, pro-peace movement throughout his career in Congress. Vietnam - The Power of Protest - Telling the Truth - Learning the Lessons was held Friday and Saturday, May 1-2, in Washington, D.C. The conference "has a star-studded program of progressive leaders of the past half century": Dolores Huerta, Danny Glover, Daniel Ellsberg, Phil Donahue, former Congresspersons Patricia Schroeder, Ron Dellums and current Reps. Barbara Lee and John Conyers, singer Holly Near, and more. The Alliance for Retired Americans Political Action Fund endorsed John Conyers, Jr. in 2014, also 2012. Signers of New York City Mayor Bill de Blasio's May 12, 2015 launched The Progressive Agenda to Combat Income Inequality included US Rep. John Conyers . Rosa Parks worked for John Conyers from 1965 to 1988. This page was last modified on 17 January 2018, at 06:12.